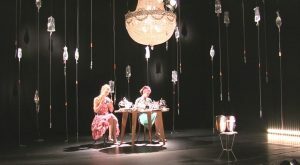 Vocht was a piece made by Edith Goddeeris and Marie-Ange Gillis for a theater festival Theater aan Zee and directed by Dirk Pauwels (Campo). The piece was based on the documentary Grey Gardens of Albert and David Mayslesa, a claustrophobic relation between two sisters. 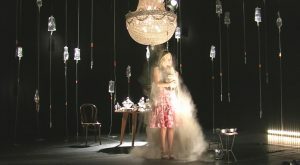 In this performance, presented in a black box, Stijn Dickel used sound as the psychology of the imaginary house where the two sisters were living, as if the house was the third character in the play. Therefore he mixed live (4 channel) recorded sounds with sounds of the actors (based on soundconcept) and the real sounds around the building of the theater itself.